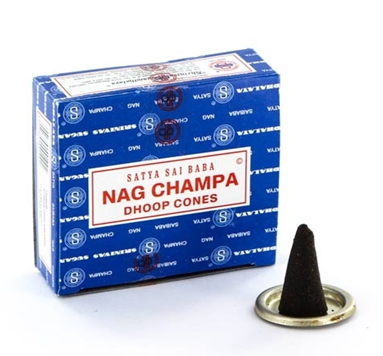 Satya Nag Champa – Incense Cones – 12 box. Original Satya Sai Baba. Made in India. 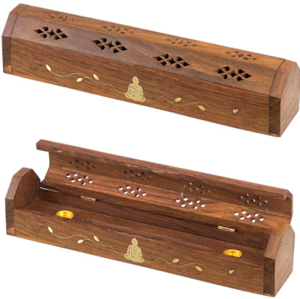 You will recognize good quality, strong earthy scent, which is evident even before the incense is burned. This is an absolute favourite as a day to day incense. The scent is pleasant, reminiscent of the Champa Flower with lighter notes of sandalwood. People who have smelled nag champa often comment on its warm, earthy scent. Satya Sai Baba Nag Champa is made in India by the Shrinivas Sugandhalaya company. Each stick is hand rolled in a special blend of fragrant woods, resins, spices, flowers and essential oils, creating an incense which is natural and pure. Description: Each cone burns for approximately 30 to 45 minutes. There are 12 cones and a small holder in this box. Original Satya Sai Baba Nag Champa, made in the finest masala tradition of India, natural herbs and resins are combined with floral extracts to create a natural blend, which is skillfully hand rolled onto a bamboo stick. Sticks burn slowly, with a wonderful fragrance and lingering presence, which will enhance any environment. Satya Sai Baba Nag Champa is the number one selling incense in the world. An instantly recognizable fragrance, prepared under the strict supervision of Satya Sai Baba, according to a blend of natural herbs. Champas – incorporate an organic ingredient native to India called “halmaddi”. Halmaddi is a gray, viscous resin extracted from the Ailanthus Malabarica tree. Its aroma is reminiscent of plumeria flowers. In India, Plumeria flowers are called champa, thus inspiring the name of the type of incense. Halmaddi absorbs the moisture in the air, often causing champa incenses to have a damp feeling to them. 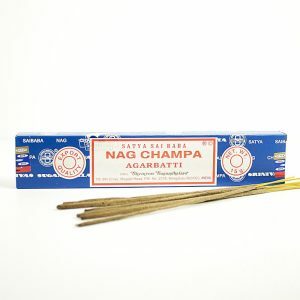 Nag Champa is one of the most popular incenses. Place a small amount of sand, grain or rice at the bottom of the burner. Layer it evenly so that the cone sits flat on top. These elements help improve the airflow in your burner, while helping to conduct less heat throughout the surface or base of the burner. Light the tip of the cone with matches or a lighter. Let 15 to 30 seconds pass, gently blow out the flame. The result will be a wafting spiral of smoke from the top of the cone as it begins to burn. Carefully place the cone in the burner. Allow the incense to burn down. Enjoy. Natural incense may have a future advantage over synthetic air fresheners as trends toward holistic natural living continue. The increasing popularity of meditation, yoga, and aromatherapy in an increasingly stimulated Western world in need of relaxation bodes well for the increased use of natural incense sticks for therapeutic benefits. Incense is crafted from a mixture of powder and essential oils, giving it a rich texture and scent. Burning incense sticks is an effective way to beat stress, encourage balance, and breathe new life into old routines. In the hustle and bustle of modern society, it can be challenging to make time for ourselves and escape from the busy pace of everyday life. Burning incense is a pleasant sensory experience that people have valued from time immemorial, and the practice is being revived more and more as people realize how important it is to attend to often neglected aspects of wellbeing, such as mental and spiritual clarity. Burning incense has a salient impact on our environment and surroundings. The fragrance of incense sticks changes our emotions, perception, and moods. Incense sticks can energize, relax, and harmonize. 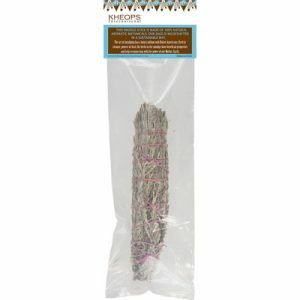 The resins and botanicals in incense help us to reconnect with nature and plants as a vital life source. We can activate visual, olfactory, and auditory awareness by accentuating incense use with ambient lighting and soothing background music. The stimulating and invigorating effects of certain types of incense sticks may be helpful in fortifying our overall potential and energy when we are weak, discouraged, or fatigued. Incense has been employed for medicinal and aromatherapy purposes since ancient times. Burning incense sticks frees fragrant chemicals into the air and has a pharmacological effect when inhaled. Incense burning was used successfully to alleviate respiratory illnesses, muscle tension, rheumatism, pain, and insomnia. People have also used certain types of incense as a disinfectant, such as lavender incense during childbirth. Incense burning is even more advantageous when accompanied with other therapies, such as massage, color therapy, and psychotherapy.